Hey, remember when Parks & Rec had that big pit they were trying to fill in? Whatever happened to that? 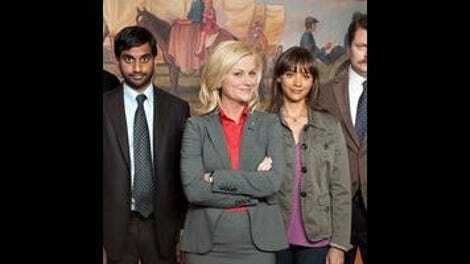 A few more: How is it possible that Tom Haverford wastes so many people's time and the office's resources? Does Andy ever really do his job? What makes Mark such a ladies' man? With the larger pit plot all but abandoned, Parks & Rec has spent the majority of its time answering those other questions, and leaving a few to mystery. The result is a compelling, character-based sitcom with the confidence that it'll eventually get back to that pit; and in the mean time, it's letting audiences geek out over the often counterintuitive, always funny residents of Pawnee. And of course, what I mean is that the show can focus on Tom and how sad, yet strangely awesome his life is. All he wants to do is seem like an important guy to the few clubs he frequents, aka his entire life. He's willing to grease the wheels of the liquor board so his "buddy" at the Snakehole can get a temporary license, and when the opportunity comes up to become a part-owner, he'll stop at nothing to make that happen. After all, then he can cross "North America" off the list of continents he needs to own a club on. So he goes to his bro-ed out buddy, aka Mr. Overcompensator, and gets part of the cash, then desperately solicits the rest of the office with a Power Point presentation and two ladies—one of whom Mark has presumably had a "thing" with. These people are not his friends; these people don't really want to have much to do with him. It's sad and more than a little sweet that Andy, who I assume doesn't have much of a relationship with Tom to begin with, comes through as Tom's truest friend with the money, given out of a gesture of pure love. Andy wants his friends to be happy, and to realize they have to spread their wings and fly and/or they deserve to be champions. I'm starting to feel a little bad for April, too. She once again went completely out of her way—very uncharacteristically—to do something for Andy (in this case, help him find an apartment that's close by so they can "carpool." And even though she was bummed he gave away his living money to Tom, she smiled at him, knowing deep down he did something completely selfless. I see this ending badly for April, I just don't know why. Overall, I think P&R is figuring out what episodes they do best. There's a few balls in the air from the get-go, a few regular citizens are made uncomfortable (Ian Roberts subtly judged for coaching the girls' soccer team; every single person at the awards ceremony where Ron gives the plaque to Leslie, then back to Ron, then Leslie, then they fight over who has it), and Andy redeems himself. Plus he makes some progress on his bag of smells. Bully to you, show, bully to you. "Black tie optional, just like life." "You do attend a surprising number of WNBA games."